The Red-billed Quelea, a major pest species, is expanding its range into the Western Cape. Sightings should be reported at the ADU Special Watch page. The results will be visible on the map below. You can also enter year values to see sightings from different time periods (enter the same year twice to see results for a particular year). 1946. There was one record of quelea at Zeekoevlei in 1946. 1986-2006. The second record in the Western Cape was in 1986, just before the first atlas (SABAP1) began. There was a slow but steady increase in sightings, published in Oschadleus & Underhill (2006). 2007. 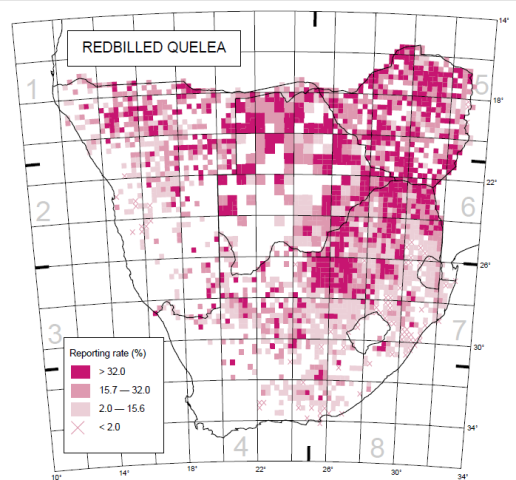 In April-May 2007 there was a large influx of quelea, published by Oschadleus (2009), and summarised here. 2008- . Subsequent records reported from 2008-2010 may be viewed here. 2009. April 2009 saw the first confirmed breeding event in the Western Cape, as reported here, and PHOWN 17. New sightings should be reported at the ADU Special Watch page. All these records are shown in the map below. Early ringing and SABAP2 records are included, but not more recent ones. If you have ringed or atlased a quelea in the Western Cape, you should still submit a Special Watch record (and include more details). Oschadleus HD, 2009. An irruption of Red-billed Quelea Quelea quelea in the Western Cape province, South Africa. Ostrich 80:193-196 (abstract). Enter start and end years to see records for different time periods, and hit 'Go'.